WASHINGTON, DC -- Donald Trump's former presidential campaign manager, Paul Manafort, has been charged with conspiring to defraud the US in his dealings with Ukraine. They stem from an inquiry into alleged Russian meddling in the US election. It has emerged that another adviser to Mr Trump admitted this month to lying about his links to Russia. George Papadopoulos pleaded guilty to making false statements to FBI agents about his dealings with an unnamed overseas academic who allegedly informed him that the Russians possessed "dirt" on Mr Trump's presidential opponent, Hillary Clinton. The charges against Mr Manafort and Mr Gates do not relate to Mr Trump's campaign but to the alleged concealment of payments from the pair's Ukrainian business dealings up to 2016. An investigation headed by special counsel Robert Mueller is looking into any links between Russia and the Trump campaign. Responding to news of the charges, Mr Trump tweeted to point out that they did not concern his campaign and asked why "the focus" was not on alleged wrongdoing involving Mrs Clinton instead. For years Paul Manafort operated on the fringes of power, a once-influential Washington player who worked with some less-than-savoury international characters because his services were no longer in high demand domestically, the BBC's Anthony Zurcher writes from Washington. Then, like many other politicos in Donald Trump's orbit, he was thrust into the spotlight because more established hands wanted nothing to do with the upstart's presidential campaign. Mr Manafort got his big break but it may end up breaking him. 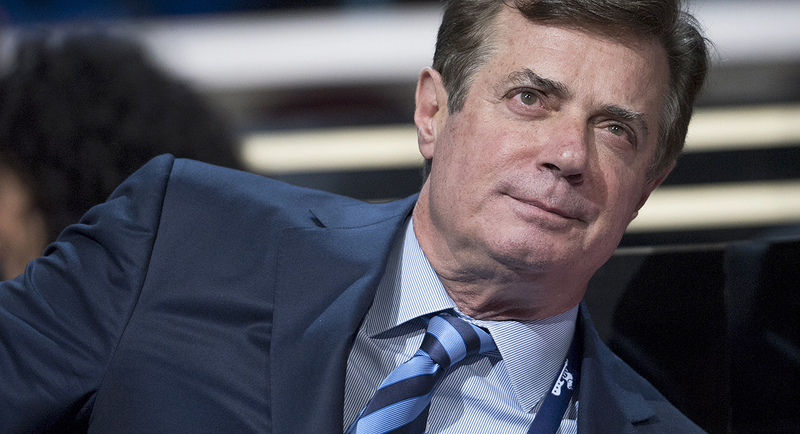 That resulting spotlight has drawn attention to Mr Manafort's past dealings and raised questions about his actions while in at the top of the Trump campaign. The good news for Mr Trump is these charges stem from Mr Manafort's past business dealings, not his campaign efforts. He is being accused of working for years for pro-Russian Ukrainian politicians and laundering millions in subsequent payments. It certainly makes Mr Trump's decision to cut Mr Manafort loose last August after details emerged of his Ukrainian ties seem a wise one. The good news has its limits, however. Mr Manafort will be under growing pressure to co-operate with the Mueller investigation. If he offers up useful information about his time during the campaign, this could be just the first domino to fall. What are the charges against Manafort and Gates? The indictment looks at their links to pro-Russian politicians in Ukraine between 2006 and 2015. It says they acted as "unregistered agents" of Ukrainian politician Viktor Yanukovych and his party, both in opposition and government. Mr Yanukovych was deposed as president in 2014 amid mass unrest over his pro-Russian policies. Mr Manafort is accused of having laundered more than $18m (£14m) through offshore bank accounts, using it to buy property, goods and services in transactions concealed from the US authorities. He is said to have "used his hidden overseas wealth to enjoy a lavish lifestyle" in America. Altogether, at least $75m in payments from Ukraine flowed through the accounts, the indictment says. Mr Manafort and his lawyer arrived at an FBI office in Washington on Monday. Mr Gates is accused of having transferred more than $3m from the offshore accounts to other accounts he controlled. He has been ordered to surrender to authorities, according to US media reports. No immediate comment from lawyers for Mr Manafort and Mr Gates was reported after the charges were revealed. What were Manafort's links to Trump? Mr Manafort, 68, has worked on several Republican presidential campaigns, beginning with Gerald Ford's in 1976. He resigned as chairman of the Trump campaign in August 2016 after being accused over his dealings with pro-Russian politicians in Ukraine. US intelligence agencies believe the Russian government sought to help Mr Trump win the election. How does the Papadopoulos case affect Trump? The justice department statement on Mr Trump's former foreign policy adviser has the potential to damage the US leader because it relates directly to his election campaign. When Mr Papadopoulos was interviewed by the FBI this January, he told them that his interactions with the foreign professor, who is said to have "substantial connections to Russian government officials", had taken place before he joined the Trump campaign in March 2016. But according to the US justice department, his meetings with the professor actually took place after he became an adviser to Mr Trump. The professor only took interest in him because of his new status within the Trump campaign, it is alleged. Mr Papadopoulos admitted having sought to arrange a meeting "between the Campaign and Russian government officials". The alleged Russian "dirt" on Mrs Clinton took the form of "thousands of emails". Why did Trump bring up Clinton? On Friday, Mr Trump accused Mrs Clinton of links with Moscow. Republican lawmakers have alleged that a uranium deal with a Russian company in 2010, when Mrs Clinton was secretary of state, was sealed in exchange for donations to her husband's charity. A Congressional investigation has been opened into the case. Democrats say it is an attempt to divert attention from the alleged ties between Russia and Mr Trump.